"Occasional extreme tides caused by unusually favorable alignments of the moon and sun are unlikely to influence decadal climate, since these tides are of short duration and, in fact, are barely larger than the typical spring tide near lunar perigee." This post sets out to show that this claim is not completely true. Richard Ray and David Cartwright (2007) have calculated the strengths and dates of the maximal lunar-solar tidal potentials over the period from 1 to 3000 A.D. Thankfully, Prof. Ray has kindly made this data available upon request. The following arguments are based upon this data set which is known as the Ray-Cartwright Table. 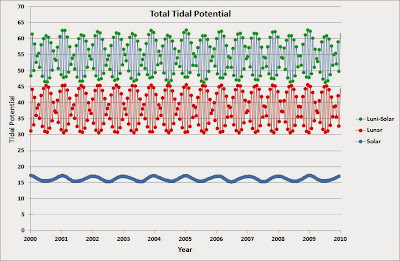 Figure 1 below shows the total equilibrium ocean tides (T) caused by the lunar-solar tides between the years 2000 and 2010 A.D i.e. where Vtot is the total tidal potential due to the Sun and Moon, g is the acceleration due to gravity (= 9.82 m/s/s) and T is in cm. Note: The terms "equilibrium ocean tide" and "tidal potential" are used interchangeably in this post, however, both refer to the equilibrium ocean tide heights measured in cm. a) The total lunar-solar tidal potential (Vtot - green curve) is the sum of the lunar tidal potential (Vlun - red curve) and the solar tidal potential (Vsol - blue curve). b) Vsol peaks once every year when the Earth is at or near perihelion (blue curve). c) The largest values of Vlun occur whenever the subtended angle of the Sun and Moon (as seen from the Earth's centre) is either less than 9 degrees (i.e. close to New Moon) or greater than 171 degrees (i.e. close to Full Moon). This means that the largest values of Vlun occur very close to each New and Full Moon where they produce the Spring Tides (red curve). d) The largest values of Vlun peak roughly once every 206 days when the spring tides occur at perigee. These tides are known as Perigean Spring Tides. The 206 year period is associated with the changing angle between the lunar line-of-apse and the Earth-Sun direction. This angle is determined by the combined motion of the Earth about the Sun and the precession of the lunar line-of-apse. The lunar line-of-apse takes 411.78 days to re-align with Earth-Sun line [note: 411.78/2 = 205.89 days]. e) Vtot (i.e. Vlun + Vsol - green curve) varies up and down between 55 and 62 centimetres once every every 206 days. Hence, first impressions indicate that Ray (2007) and Ray and Cartwright (2007) correctly concluded that if you compare peak Perigean spring tides with typical Perigean spring tide that are adjacent in time, there is little or no difference in their relative strength on decadal time scales [e.g. compare Perigean spring tides with total potentials that are greater than 60 cm in figure 1]. However, Ray (2007) and Ray and Cartwright (2007) have missed one important detail. The problem with their simple analysis is that it does not take into account the different ways in which the lunar tides can interact with the Earth’s climate system. obliquity and its annual motion around the Sun. simple “resonance” model, it is not so much in what times do the lunar tides reach their maximum strength, but whether or not there are peaks in their strengths that re-occur at the same time within the annual seasonal cycle. A good analogy is a child on a swing. If you consider the annual seasons as being the equivalent of the child on the swing as they slowly move back and forward then the lunar tides can be thought of as the hand of the person who pushes the swing. Clearly, the hand pushing the swing is most effective in imparting energy to the child on the swing if they give a push at the highest point of their motion. Similarly, peak lunar tides should have their greatest impact upon the seasonal swings of the climate system if they are applied at a specific point in the seasonal cycle e.g. the summer or winter solstices. 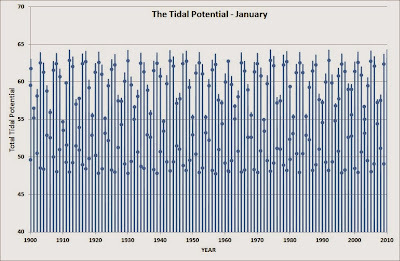 Figure 2 shows all of the total tidal potentials listed in the Ray-Cartwright Table that occur in the month of January between the years 1900 and 2010 A.D.
on decadal time scales. 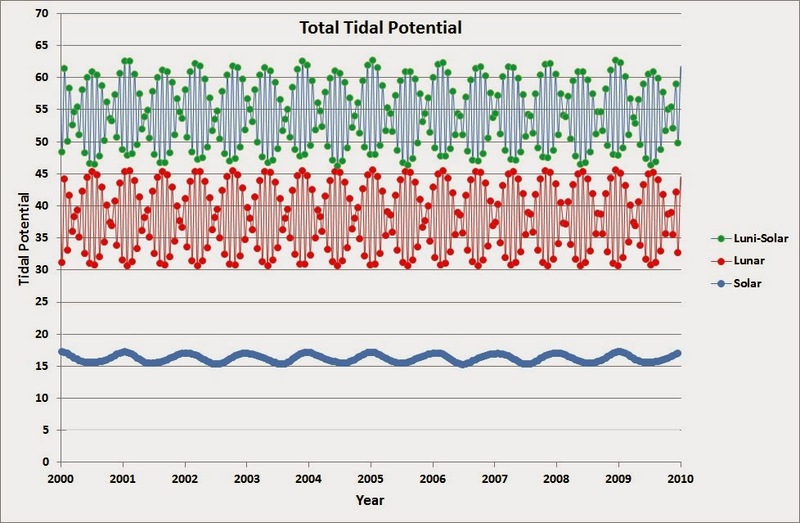 Figure 2 shows that the peak equilibrium ocean tide (or total tidal potential) varies by +/- 7 % either side of its mean peak value of 59 cm on a time scale of 4.425 years. 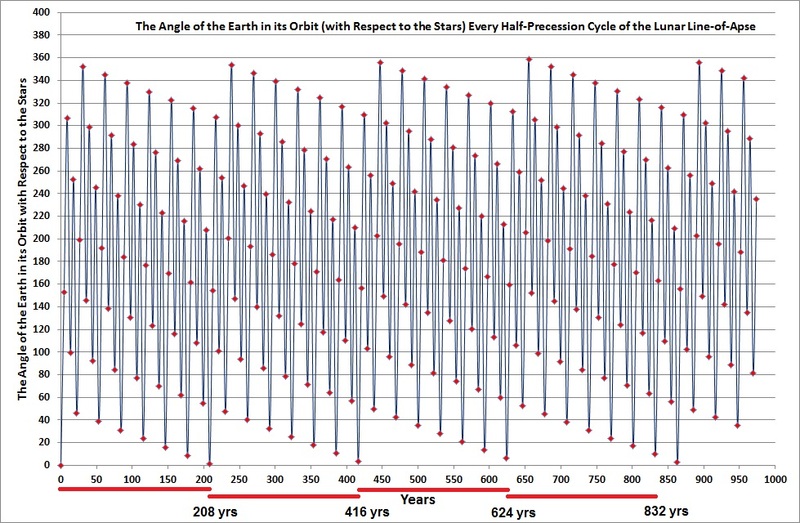 Note: The repetition cycle of 4.425 years is simply half the time required for the lunar line-of-apse to precess once around Earth with respect to the stars. 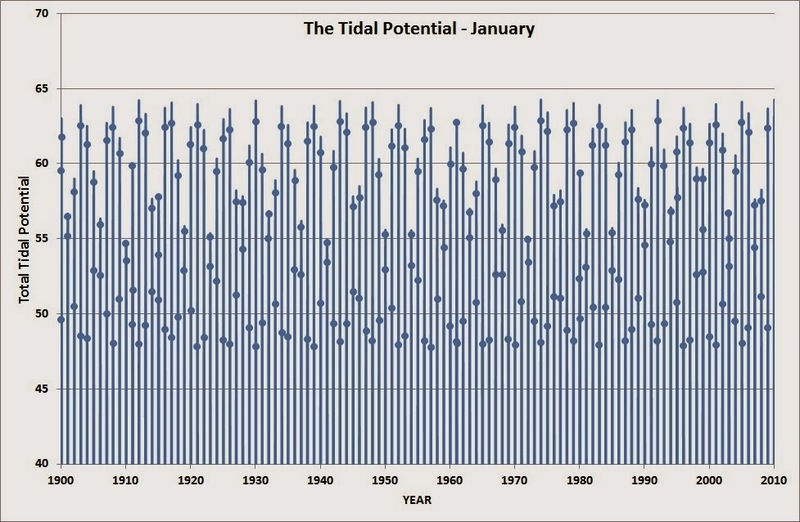 Even greater decadal variations in the total tidal potential are produced if we differentiate between those that occur at New Moon in January (Figure 3) from those that occur at Full Moon in January (Figure 4). 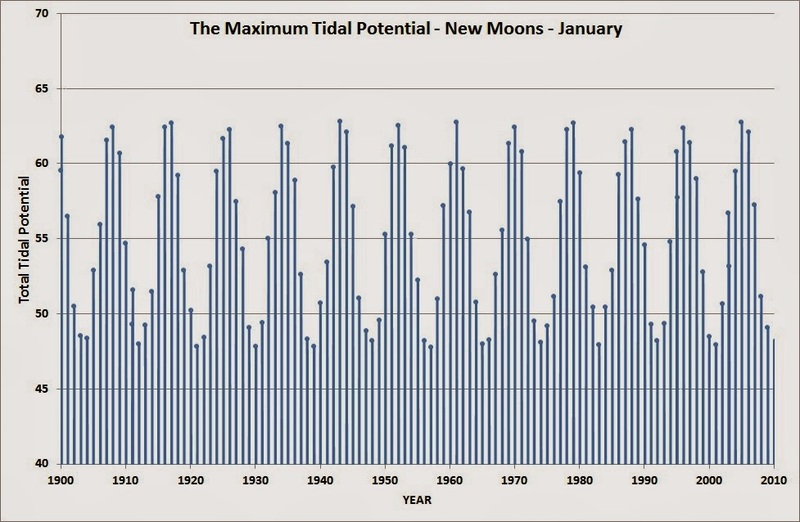 Figure 3 shows that the peak equilibrium ocean tide (or total tidal potential) at New Moon vary by +/- 13.5 % either side of theirmean peak value of 55.5 cm, on a time scale of 8.85 years. While figure 4 shows that the peak equilibrium ocean tide (or total tidal potential) at Full Moon vary bu the same amount over the same time scale of 8.85 years. 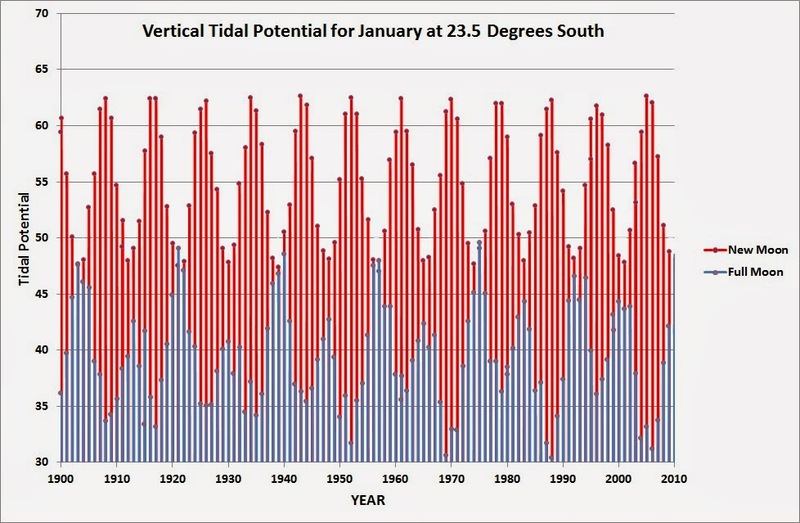 However, the peak tidal potentials are shifted in phase by 180 degrees (equivalent to 4.425 years). The effect of lunar phase on the magnitude of monthly variation in the total tidal potential on decadal time scales must be accounted for because at times near summer/winter solstice i.e. during the months of December or January and June or July, the tides induced by spring tides at New and Full Moon affect distinctly different parts of the planet. 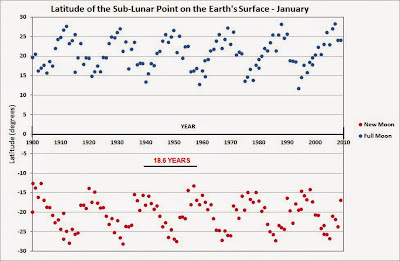 Figure 5 shows the latitude of the sub-lunar point on the Earth's surface for each of the tidal potentials produced by the (near) New and (near) Full Moons that are displayed in figures 3 and 4. We see that in figure 5 that the latitude of the sub-lunar points of all of the New Moons on the Earth's surface are between about 13 and 28 degrees South while the sub-lunar points of all of the Full Moons on the Earth's surface are between about 12 and 29 degrees North. 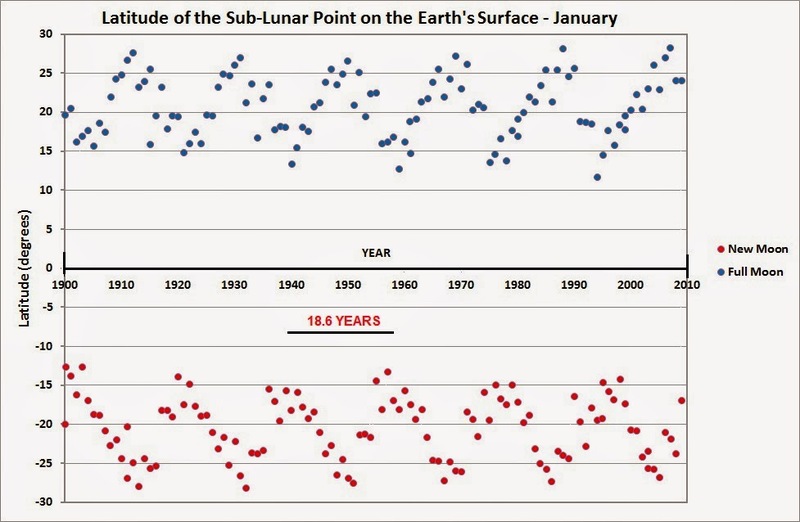 Note: Figure 5 shows that a clear 18.6 year sinusoidal variation in the latitude of the sub-lunar points tales place in each hemisphere. One way to correct the tidal potentials for the substantial differences in latitude between New and Full Moon is to multiply each potential by the cosine of the difference in latitude between its sub-lunar point and 23.5 degrees South. This give the approximate vertical tidal potential for each New and Full Moon event at a latitude of 23.5 degrees South (on the Earth's surface). Figure 6 shows that the total equilibrium ocean tide corrected to a latitude of 23.5 degrees South. 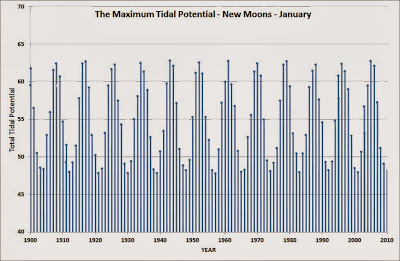 We can see from this figure that the tidal potentials at New Moon dominate total tidal potential. This means that the peak total equilibrium ocean tide (or peak total tidal potential) varies by +/- 13.5 % either side of its mean peak value of 55.5 cm, on a time scale of 8.85 years. Note: All the claims that are made in this post by the author also applies if the interaction window between the lunar tides and the Earth's climate occurs over a three month (seasonal) time period centred upon the winter solstice (May-Jun-Jul) or the summer solstice (Nov-Dec-Jan). unlikely to influence decadal climate, since these tides are of short duration and, in fact, are barely larger than the typical spring tide near lunar perigee." Indeed if, as is most likely, the interaction between the lunar tides and Earth's climate primarily takes place over a monthly to season window then it clear from the above post that the total tidal potential can vary by at least +/- 13.5 % either side of its mean peak value of 55.5 cm, on a time scale of 8.85 years. of nearby tidal spectral lines. The 18.6-yr modulation of diurnal tides is the most likely to be detectable." This claim may be partly true. There a Tidal Connection?, J. Climate, 20, 3542–3560. others can have easy access. the Earth’s LOD from itslong-term trend is greatest. 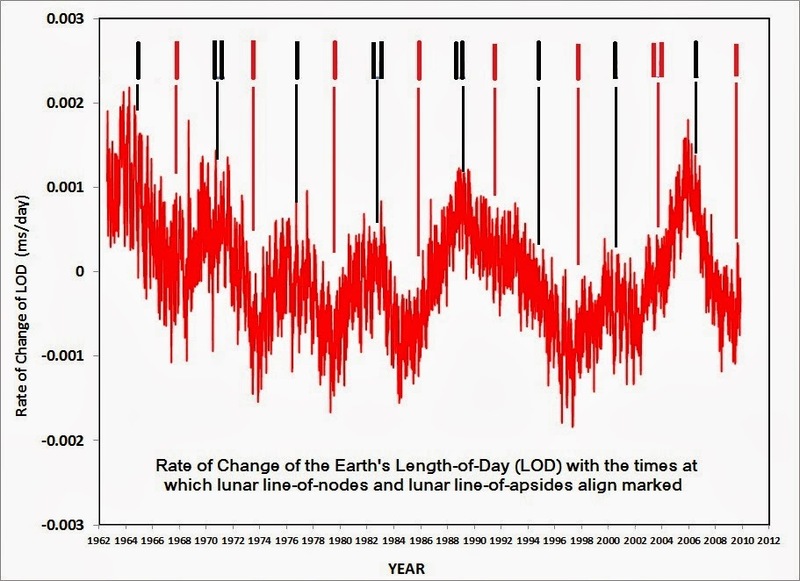 rate, namely the long term lunar tides. It is important to note that the times of peak asymmetry in the Sun's motion about the centre-of-mass of the solar system and the times of peaks (absolute) deviation of the Earth's LOD (length-of-day) from its long-term trend have been shifted backwards by ~ 8 years. This means that they peak ~ 8 years prior to the peaks seen in the long-term PDO proxy index. I will stick my neck out here. If this pattern that we've seen over the last 300 years holds then the PDO should should start turning positive sometime soon after 2016. There was a peak in the asymmetry of the Sun's motion in 2008 and so this should be followed roughly eight years later by a rapid rise in the PDO index. If you plot the rate of change of the Earth's Length of Day (LOD) [with the short-term atmospheric component removed] against time [starting in 1962] you find that there is a ~ 6 year periodicity that is phase-locked with the 6 year period that it takes the lunar line-of-nodes to re-align with the lunar line-of-apse [see the first note directly below and reference  for a description of the method used to determine the time rate of change of LOD]. [NB: that in the case of figure 1 the line-of-nodes and line-of-apse are just re-aligning with each other. They do not necessarily realigned with the Sun - see figure 2]. A much better alignment between the lunar orbital configuration and the rate of change of the Earth's LOD is achieved if we re-plot figure 1 below and superimpose the times when solar/lunar eclipses occur at or near the times of lunar perigee. These events occur at or very near to the times when both the lunar line-of-apse and lunar line-of-nodes point directly towards or away from the Sun. When the Moon is in this particular configuration with respect to the Sun and the Earth (marked by vertical red lines in figure 2), our planet experiences extremely strong luni-solar tidal forces known as Perigean Spring Tides. Figure 2 (top graph below) shows whenever this occurs, the rate of change of the Earth's LOD undergoes an inflection in its value. The tight relationship between the configuration of the lunar orbit and the rate of change of LOD is further reinforced by the lower graph in figure 2. This shows lowest velocity (in km/sec) of the Moon its orbit, when perigee occurs at or near the First/Last Quarter of the Moon. This is a reasonable proxy for the actual strength of global lunar tides impacting the Earth (see note below). 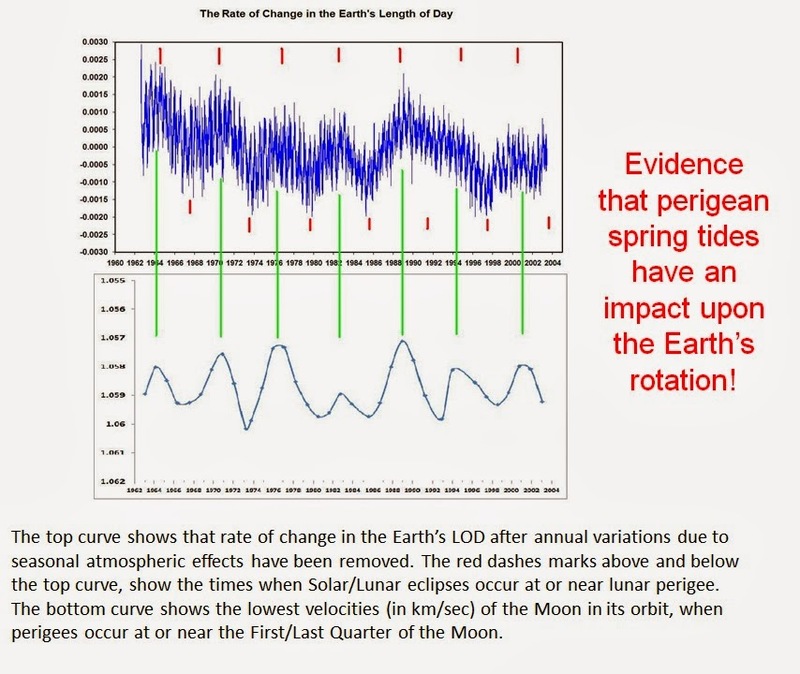 Hence, figure 1 and 2 firmly establish that there is a direct connection between the conditions that produce extreme Perigean Spring Tides and long-term changes in the rate-of-change in the Earth's Length-of-Day (LOD). Now, if we can show that the other planets of the Solar System have an effect upon setting the rates of precession of the line-of-nodes and line-of-apse of the lunar orbit then we can plausibly claim that the spatio-temporal configuration of the planets plays a role in producing changes in the Earth rotation rate on decadal to inter-decadal time scales. B. Evidence that the Precession of the Lunar Line-of-Nodes and the Lunar Line-of-Apse are linked to the orbital period of the planets. If we look at the realignment period between the half pro-grade synodic period of Jupiter and Saturn (1/2 JS cycle) with the retrograde realignment cycle of the inferior-conjunctions of Venus and Earth with the Terrestrial year (VE cycle) i.e. This is extremely close to half the time of precession of the lunar line-of-apse with respect to the stars [= (8.8501 / 2) = 4.42505 sidereal years - error = 0.00336 years or 1.23 days]. This means that these three planets return to the same relative orbital configuration at a whole multiple of 6.40 years. Amazingly, the point in the Earth’s orbit where the 2nd tidal harmonic occurs (i.e. 1 ¼ TD), rotates around the Sun (with respect to the stars) once every 6.3699 years. This is just over three hundredths of year less than the time required for the realignment of the positions of the three largest terrestrial planets. Thus, the realignment time for the positions of the three largest terrestrial planets and the orbital period of Jupiter appear to be closely synchronized with the time period over which the Earth experiences a maximum change in the tidal stress caused by the precession of the line-of-nodes of the lunar orbit. The periods of precession of the line-of-nodes and line-of-apse of the lunar orbit (when measured with respect to the stars).appear to be synchronized with the relative orbital periods of Jupiter and the three largest terrestrial planets. In addition, long-term changes in the rate of change of the Earth's LOD [excluding short-term changes (less than a couple of years) cause by the exchanges of angular momentum between the atmosphere, oceans and the Earth's crust] appear to be synchronized with the conditions that produce extreme Perigean Spring Tides. This implies that the spatio-temporal configuration of the planets must play a role in producing changes in the Earth rotation rate that we see on decadal to inter-decadal time scales. 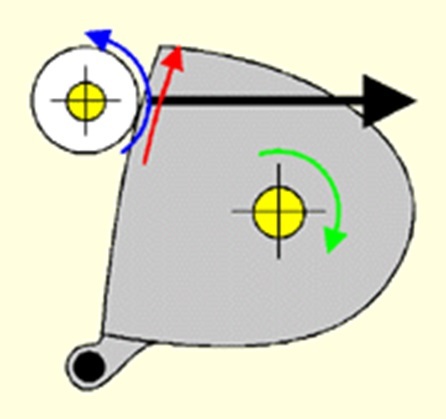 Golfers use a physical principle called the Gear Effect to either slice or hook a golf ball off the tee.Figure 1 shows how the Gear Effect works. If the golf ball hits the (curved) face of the club off-centre, it applies a force (horizontal black arrow) to the club which induces a clock-wise rotation of the club head (green arrow) about its centre-of-mass (bottom right yellow circle with cross-hairs). 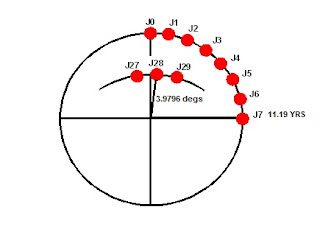 The resultant rotation of the face of the the club head (red arrow) applies a side-ways force to the golf ball at the point of contact, producing an anti-clockwise rotation (blue arrow) of the golf ball (Note: The ball will roll from the toe (top) towards the centre of the club face). This particular application of the Gear Effect produces a hook shot. The purpose of this article is to show how the Gear Effect can be combined with the VEJ Tidal Torquing model to produce a Spin-Orbit Coupling model that links the rotation rate of the outer layers of the Sun to the Sun's motion about the centre-of-mass of the solar system (CMSS). 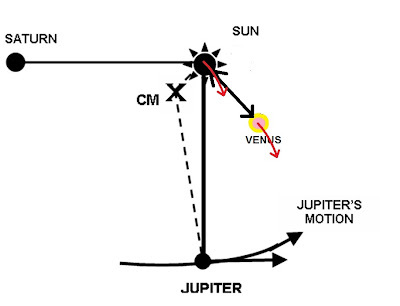 In order to understand how the Gear Effect can be combined with the VEJ Tidal Torquing model, however, we must first show how the orbital motions of the Jovian planets determine the Sun's motion about the CMSS (often called the Solar Inertial Motion or SIM) and then discuss the Quadrature Effect. Given the fact that the Sun is over 1000 times the mass of Jupiter, it is often assumed that the CMSS is located at the centre of the Sun. In fact, the centre of the Sun moves about the CMSS in a series of complex spirals with the distance between the two varying from 0.01 to 2.19 solar radii (Jose 1965). This motion is the result of the gravitational forces of the Jovian planets tugging on the Sun. Jose (1965) quantified the motion of the Sun about the CMSS and showed that the time rate of change of the Sun’s angular momentum about the instantaneous centre of curvature = dP/dT , or torque, varies in a quasi-sinusoidal manner similar to the variation seen in the solar sunspot number. In fact, Jose (1965) found that the temporal agreement between variations in dP/dT and the solar sunspot number were so good that it strongly hinted that there was a connection between the planetary induced torques acting on the Sun and sunspot activity. However, he did not fully explain how this connection worked. Figure 2: This shows a typical orbit for the Sun about the CM of the Solar System, with the position of the Sun marked by an ‘X’ at the times when Jupiter and Saturn are in opposition (1), first quadrature (2), conjunction (3), second quadrature (4), and opposition (5) [see Notes 1 and 2 below]. 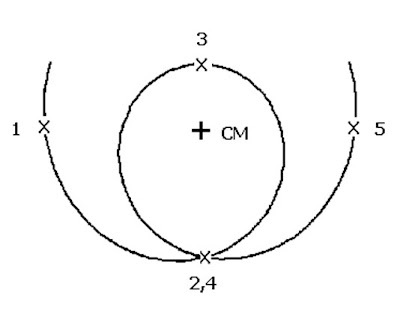 Figure 2 shows a typical orbit of the Sun about the CMSS. It is not the simple ellipse that you would expect if gravitational effects of Jupiter dominated the Sun’s motion. The Sun’s orbit about the CMSS deviates from an ellipse primarily because of the added influence of Saturn. Obviously, when Jupiter is at inferior conjunction as seen from Saturn, i.e. the planets are on the same side of the Sun (see note 1), the Sun will be at its greatest distance from the CMSS; when Jupiter is at superior conjunction, as seen from Saturn, i.e. the planets are on opposite sides of the Sun (see note 2), the Sun will be closest to the CMSS. Similarly, when the planets are in quadrature, the Sun’s distance from the CMSS will be roughly the same and somewhere in between these two extremes. This point is highlighted in figure 2 where we have marked a set of sequential events concerning the orbits of Jupiter and Saturn along the Sun’s orbit about the CMSS. Jupiter and Saturn start in opposition at (1), first quadrature at (2), conjunction at (3), second quadrature at (4) and finally back to opposition at (5). a) The times at which the Sun experiences maximum torque (dP/dT ) as it moves around the CMSS, corresponds very closely with the times of quadrature for Jupiter and Saturn (Jose 1965) i.e. points (2) and (4) in figure 2.
b) Similarly, the times at which the torque acting on the Sun is zero (this also the time at which the torque acting on the Sun is most rapidly changing) correspond very closely with the times of opposition and conjunction of Jupiter and Saturn, i.e. points (1), (3), and (5) in Figure 2. Every 9.9±1.0 yr, the planet Saturn is in quadrature with the planet Jupiter (i.e. the angle between Saturn and Jupiter, as seen from the Sun, is 90 degrees). Figure 3 shows the orbital configuration of a quadrature of Jupiter and Saturn when Saturn follows Jupiter in its orbit. 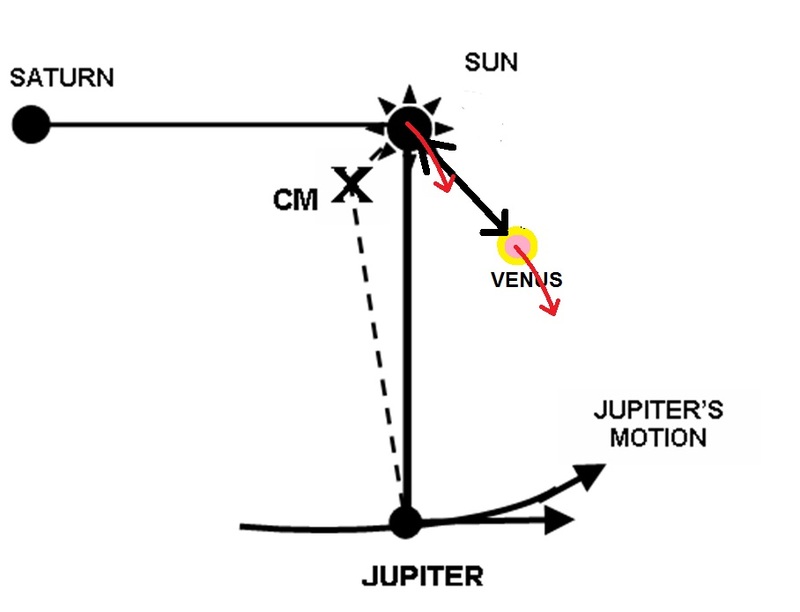 Referring to this diagram, we see that Saturn drags the CM of the Sun, Jupiter, Saturn system (CMSJSa) off the line joining the planet Jupiter to the Sun. As a result, the gravitational force of the Sun acting upon Jupiter speeds up its orbital motion about the CMSJSa. At the same time, the gravitational force of Jupiter acting on the Sun slows down the orbital speed of the Sun about the CMSJSa. However, the reverse is true at the next quadrature, when Saturn precedes Jupiter in its orbit. 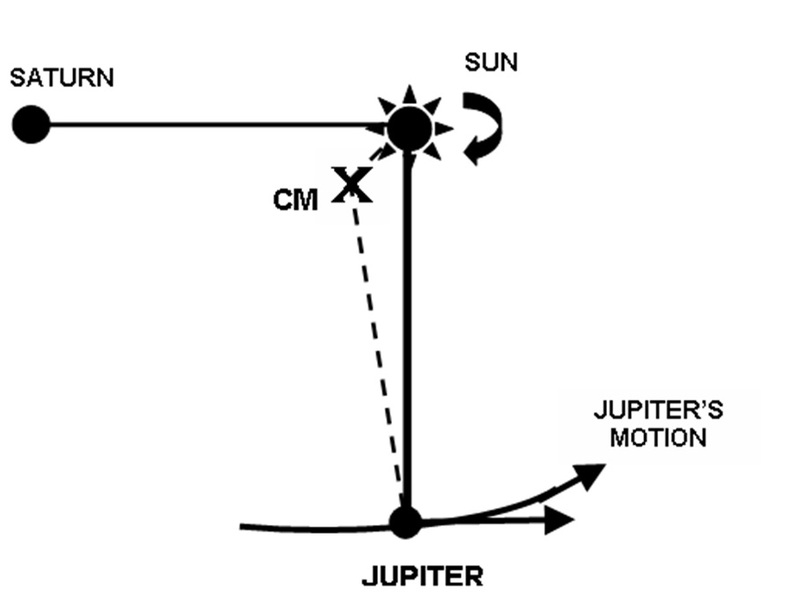 In this planetary configuration, the mutual force of gravitation between the Sun and Jupiter slows down Jupiter’s orbital motion about the CMSJSa and speeds up the Sun’s orbital motion about the CMSJSa. Hence, the Sun’s orbital speed about the CMSJSa (as well as the CMSS) should periodically decrease and then increase as you move from one quadrature to next (Jose 1965). The curves published by Jose (1965) showing the motion of the Sun about the CMSS can be used to directly measure the speed of the Sun along its orbital path. Figure 4 shows the speed of the Sun along its orbit, between the oppositions of Jupiter and Saturn in 1842.2 and 1861.9. Superimposed on this figure are symbols showing the syzygies (i.e. alignments) and quadratures of Jupiter and Saturn. This figure clearly shows that our prediction about the Sun’s orbital speed about the CMSS is indeed correct. In this plot, we see that the speed of the Sun almost halves (from ∼16 to 8 ms^(−1)) over the period from 1842 to 1850, roughly centred on the time of the first quadrature in 1846.5. 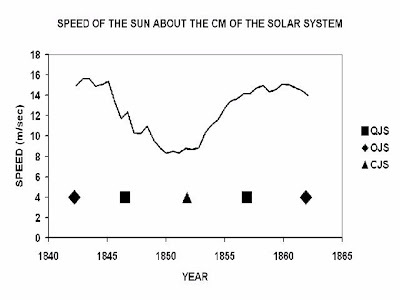 And then after reaching a minimum near conjunction in 1851.8, the speed almost doubles (from ∼ 8 to 15 ms^(−1)) over the period from 1850 to 1860, again roughly centred on the time of quadrature in 1856.9.
accompanied by a comparable increase in the Sun’s angular momentum. and Saturn, i.e. 19.858 yr. 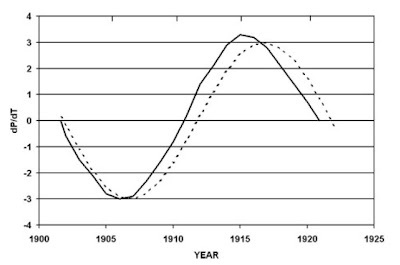 Figure 5 shows a plot of dP/dT , derived from data in the paper by Jose (1965), for one cycle between 1901.6 and 1920.9 (solid line). Superimpose on this plot (dashed line) is a sinusoidal function with a period equal to the time between the consecutive oppositions at 1901.8 and 1921.8 (i.e. 20.0 yr) and an amplitude chosen to match of the first minimum. The curves in figure 5 show that it is a reasonable first approximation to say that the Sun’s orbital motion around the CMSS (as well as the CMSJSa) is being driving by a torque (dP/dT ) that is varying sinusoidally with a period of ~ 19.9 yr. However, there are other weaker perturbing influences that are advancing or retarding the times for the maxima, minima and zero points of dP/dT, compared to the cardinal planetary configurations. These weaker perturbations are primarily caused by the combined gravitational influences of Neptune and Uranus (Fairbridge and Shirley 1987). However, for the purposes of the following arguments, we will ignore their effects upon the motion of the Sun in this article. In figure 6 below, we re-plot figure 3 with the terrestrial planet Venus preceding Jupiter in its orbit. As with figure 3, figure 6 shows the situation where Saturn and Jupiter are in quadrature, with Saturn following Jupiter. In these circumstances, the Quadrature Effect ensures that the Sun's anti-clockwise motion about the CMSJSa will be slowed by the gravitational force of Jupiter. If the Sun's speed about the SMSJSa slows down between one opposition and the following quadrature (as shown in figure 6 below), then the same must be true for the terrestrial planets, since their orbital motion is, for all intents and purposes, constrained to move about the centre-of-mass of the Sun rather than the CMSJSa. The red arrows in figure 6 represent the decrease in speed of the Sun and Venus as they revolve in an anti-clockwise direction about the SMSJSa. This decrease in speed is shared by both the Sun and Venus so that the two bodies effectively moves as one, maintaining their orientation and spacing. Hence, the Quadrature Effect should have little or no effect upon the the VEJ Tidal-Torquing model and it should not be able to modulate the rotation rate of the outer layers of the Sun. This is true simply because there is no (significant) change in the relative positions of the Sun and Venus. Now, imagine that the Jupiter-Sun-Saturn system (with its own CM = CMSJSa) is like the golf club head in the Gear Effect and that the planet Venus (also with its own CM) is like the golf ball. In figure 7, shown below, we see that Venus applies a gravitational torque to the Jupiter-Sun-Saturn system that forces this system to reduce its orbital velocities about the CMSJSa (red arrow). In terms of the Gear Effect analogy, this is the equivalent of the club head rotating in a clock-wise direction about its centre-of-mass. In like manner, in figure 7, we see that the Jupiter-Sun-Saturn system applies a gravitational torque to Venus that speeds up the motion of Venus about the CMSJSa (dark curved arrow emanating from Venus) . a) Unlike the Quadrature Effect, the torques involved in the Gear Effect try to change the orientation and spacing between the Sun and Venus e.g. in relation to the specific case shown above, even though these gravitational torques are very minute, they produce a net anti-clockwise rotation of the Sun and Venus about their mutual center-of-mass (yellow cross). In terms of the Gear Effect analogy, this is the equivalent of the golf ball rotating in a counter-clock-wise direction. b) Even though the net gravitational torques try to produce an anti-clockwise rotation of the Sun and Venus about their mutual center-of-mass, some of the resulting angular momentum will probably end up changing the rotation rates of both Venus and the outer layers of the Sun. c) Given the minute nature of the torques applied and velocity changes involved, it is obvious that the effects of the Gear Effect will be greatest at the times when Venus and the Earth are aligned on the same side of the Sun. At these times, the Jupiter-Sun-Saturn system (at quadrature) would experience the greatest gravitational force from the Terrestrial planets and the centre-of-mass of the aligned Sun-Venus-Earth system would be furthest from the centre of the Sun. Thus, the Gear Effect should have an effect upon the VEJ Tidal-Torquing model and it should be able to modulate the changes in rotation rate of the outer layers of the Sun that are being caused by the VEJ tidal-torquing. There appear to be at least two ways that the Jovian and Terrestrial planets can influence bulk motions in the convective layers of the Sun. a) Tidal bulges are formed in the convective layers of the Sun by the periodical alignments of Venus and the Earth. b) Jupiter applies a gravitational torque to these tidal bulges that either speed up and slow down the outer convective layers of the Sun. c) Jupiter's net torque increases the rotation rate of the surface layers of the Sun for seven Venus-Earth alignments (lasting 11.19 years) and then decreases the rotation rate over the next seven Venus-Earth alignments (also lasting 11.19 years). d) The model produces periodic changes in rotation rate of the outer convective layers of the Sun that are responsible for the 22.38 year Hale-like modulation of the Solar activity cycle. a) The Gear Effect modulates the changes in rotation rate of the outer convective layers of the Sun that are being driven by the VEJ tidal-torquing effect. b) This modulation is greatest whenever Saturn is is quadrature with Jupiter. 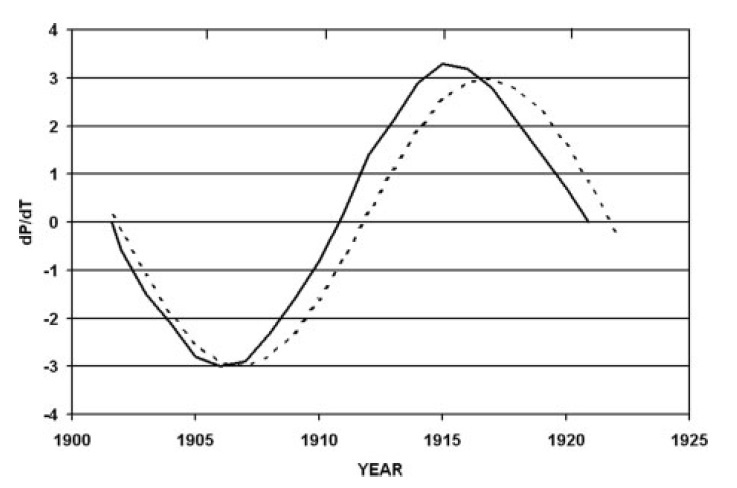 These periodic changes in the modulation of the rotation rate increase and decrease over a 19.859 year period. c) The Gear Effect is most effective at the times when Venus and the Earth are aligned on the same side of the Sun. Hence, it makes sense to combine the VEJ Tidal-Torquing Model with the Gear Effect to produce a new model called the VEJ Spin-Orbit Coupling Model. This new model is called a spin orbit coupling model for the simple reason that its net outcome is to produce link between changes in the rotation rate of the outer convective layers of the Sun (SPIN) [mostly likely near the Sun's equatorial regions)] and changes in the Sun's motion about the CMSS (ORBIT). (22.38 x 19.859) / (22.38 - 19.859) = 176.30 years. The 176.30 year period is subject modulation by the period of the Jupiter-realignment cycle for the VEJ Tidal-Torquing Model of 1151.0 years. This produces the 208 year de Vries Cycle. All these are very close to the periods that are found by McCracken et al. using two 9400 year long Be10 records from the Arctic and the Antarctic and a similar length C14 record. 2. Jose, P.D. : 1965, Sun’s motion and sunspots. Astron. J. 70, 193 – 200. 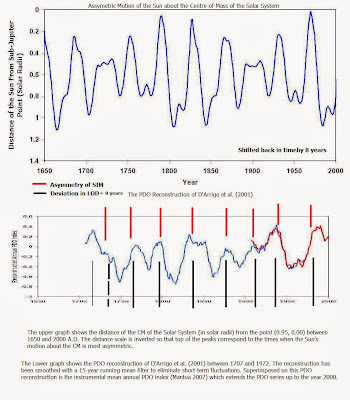 Direct instrumental observations of the Sun since 1610 have shown that the level of sunspot activity on the Sun has a mean periodicity of 22.3 years, known as the Hale cycle. In addition, these observations of the Sun have shown that there are longer-term periodicities present in the level of solar activity. a) the de Vries cycle amplitude varies with a period of about 2200 years . In other words, its appearance is intermittent in nature. b) the largest amplitude of the de Vries cycle are found near Hallstatt cycle minima centered at 8,200, 5,500, 2,500 and 800 B.P . c) grand solar minima occur preferentially at minima of the Hallstatt cycle that are characterized by large de Vries cycle amplitudes . d) the cycle length is somewhere in the range 205 - 210 years, with the more precise estimates being in the range 207-208 years. Abreu et al. 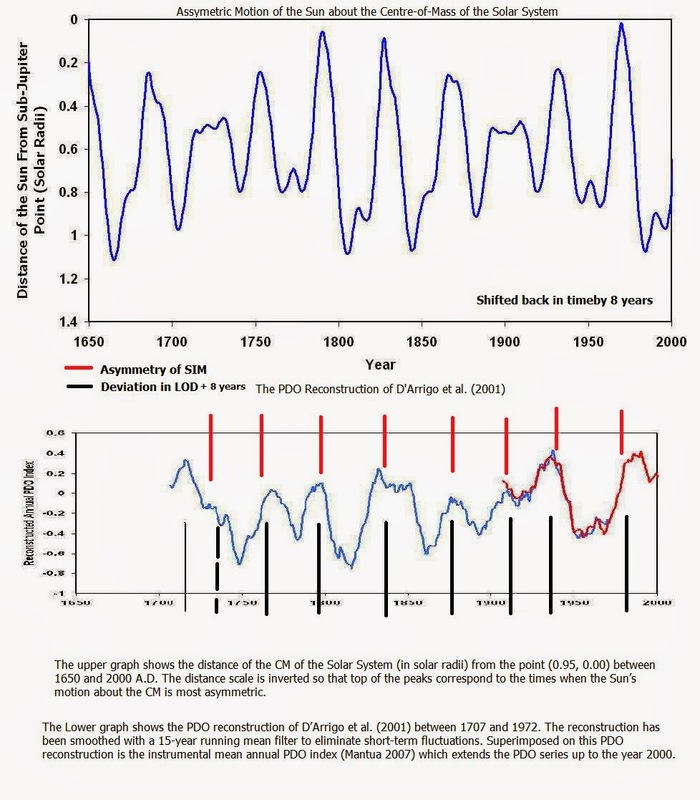 (2012)  have identify a 208 year period in a 9400 year reconstruction of the solar modulation potential that is derived from C14 and Be10 observations taken from ice cores. The solar modulation potential is thought to be a good indicator the strength of the solar magnetic field that is responsible for the deflection of cosmic ray, and so a good proxy of the overall level of past solar magnetic activity. Abreu et al. (2012)  also show that there is a 208 year period in the planetary induced torques that could act upon any asymmetric structure in the boundary layer known as the solar tachocline. These authors propose that it these planetary induced torques that could be responsible for modulating the long-term solar magnetic activity on the Sun. Abreu et al. (2012)  do not identify the specific physical mechanism that is responsible for producing the 208 year period in the planetary torques, although it is reasonable to assume that it must be linked in some way with the synodic interactions between orbital period of Jupiter [the main source of planetary torque] and one or more of the other planets. However, it can be shown that there is a natural 208 year periodicity associated with the position of the Earth in its orbit when it is observed at intervals separated by half the precession cycle of the Lunar line-of-apse, in a reference frame that is fixed with respect to the stars. The following diagram shows the angle that the Earth in its orbit about the Sun forms with a fixed direction in a sidereal reference frame, at time steps of half the precession period of the lunar line-of-apse (= 4.42558131 sidereal years for 2000.0). This angle is plotted as a function of time measured in sidereal years. A: The lunar line-of-apse is a line passing through the centre of the Earth that connects the perigee and apogee of the lunar orbit. B: The lunar line-of-apse precesses about the Earth once every 8.85116364 sidereal years, when measured with respect to the fixed stars. C: The reference direction in the sidereal frame that was used (as T = 0 years) is that of the Earth on January 1st 2000.0 at 00:00 UT. The above diagram clearly shows that there is a natural 208 year periodicity in the alignment of the Earth with respect to the fixed with the stars when it is observed every half precession cycle of the Lunar line-of-apse. 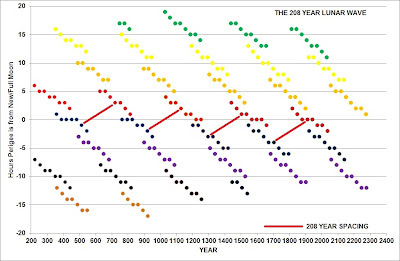 It also shows that the 208 year periodicity in alignment slowly drifts out synchronization over a period ~ 500 years. 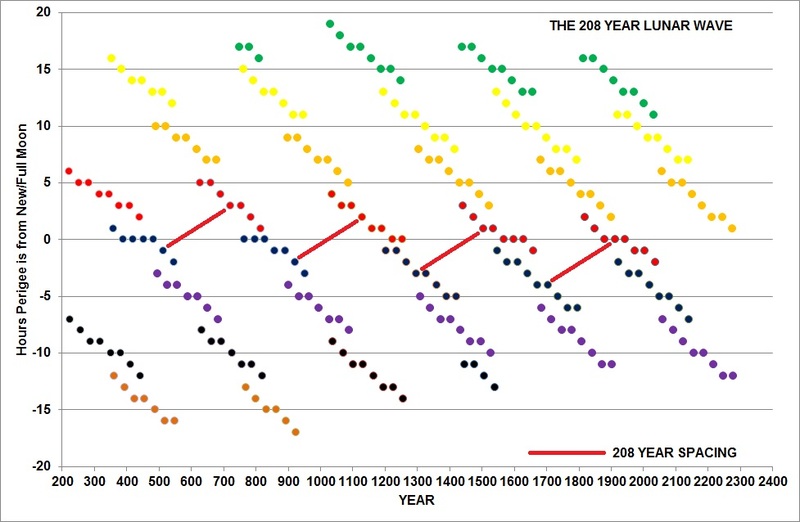 Hence, this Earth/Lunar alignment pattern exhibits two characteristics that mimic those of the de Vries cycle, namely a periodicity of 208 years and slow loss of synchronicity on millennial time scales. 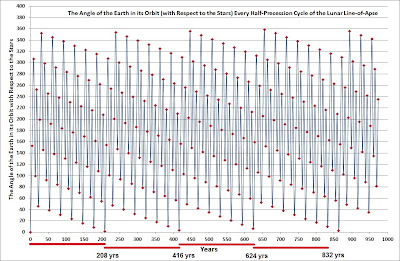 An alternative way to display the 208 year Earth/Lunar cycle that is based upon ephemeris data rather than extrapolated mean lunar orbital data is shown in the following diagram . This diagram shows the number of hours perigee is away from New or Full Moon, when the Moon is at perigee between the 27th of December and the 10th of January, plotted against time in years. The limits that have been placed upon the dates of perigee are designed to restrict the observational window to +/- seven days either side of a nominal fixed date in the seasonal calender (in this case the 3rd of January which roughly corresponds to modern day Perihelion). In essence, they are restricting the observational window to +/- a quarter of a lunar orbit either side of a point in the Earth's orbit that is "fixed" with respect to the stars. In this diagram, you see long diagonal bands from the upper left to the lower right of the diagram. The dots of the same colour in any given long diagonal band lie inside the +/- seven day calender window. Each dot is separated from its immediate neighbor (of the same colour) by almost exactly 31 years. If you move down and to the right along the long diagonal bands, from a dot of one colour, to a dot of the next colour that has the same date in the seasonal calender, you jump 106 years. There are three separate colour groupings in this diagram. The first grouping, vertically from the top to the bottom of the diagram, is green, red and black. The second is yellow, blue, and brown and the third is orange and purple. As you move vertically down from one colour to the next in a given colour grouping, you advance by almost exactly four years e.g. if you pick a set of green dots near the top of the diagram, the set of red dots immediately below it are shifted forward in time by four years, and the set black dots immediately below the red dots are shifted forward by a further four years. The important point to note is that the symbols in this diagram form long diagonal lines or waves that are separated by almost exactly 208 years [see the red spacing bars in the above diagram that link points that are separated by 208 years]. Detailed investigations show that paired points in the above diagram that are separated by 208 years, occur almost exactly 2 1/3 days apart in the seasonal calendar. This accounts for the change between the observed time of perigee and the time of New/Full Moon that occur between the paired points separated by 208 years (i.e. it accounts for the slope of the red line and, hence, the tilt of the diagonal waves). It turns out that the 2 1/3 day slippage backward in the seasonal dates of the alignments between New/Full Moon and the lunar perigee every 208 years, corresponds to a westward slippage of ~ 40 arc seconds per year. This close to the westward drift of the equinoxes by 50.3 arc seconds per year that is caused by the precession of the equinox. So, what it is telling us is that if we correct the above diagram for the effects of the precession of equinoxes (i.e. correct for the drift between our co-ordinate frame and the fixed stars) we get a Earth/Lunar repetition cycle for the position of the Earth in its orbit (with respect to the stars) of 208 years. Interestingly, the Earth/Venus pentagram alignment pattern resets itself with respect to the Sun and the fixed stars once every 149.5 VE alignments (of 1.59866 years) = 238.9996251 years ( with an error of 0.134964 degrees). This means that that if you have a New Moon at closest perigee, 31.00 sidereal years (+ 2 days) later, you will have a Full Moon at closest perigee, on almost the same day of the calender year. a) The position of the Earth in its orbit, as seen once every half precession cycle of the Lunar line-of-apse (= 4.42558131 sidereal years for 2000.0), resets itself with respect to the stars once every 208.0 sidereal years. b) The relative position of the Moon in its orbit about the Earth compared to the Lunar line-of-apse reset themselves with respect to the Sun and the fixed stars almost exactly once every 31.0 sidereal years. d) the Earth/Venus pentagram alignment pattern resets itself with respect to the Sun and the fixed stars once every 149.5 VE alignments (of 1.59866 years) = 238.9996251 years. One is left with the feeling that this is more than just a coincidence. 2. Peristykh, A.N. and Damon, P.E. (2003) Persistence of the gleissberg 88-year solar cycle over the last ~12,00 years: Evidence from cosmogenic isotopes. Journal of Geophysical Research 108, 1003. 5. Abreu J. A., Beer J., Ferriz-Mas A., McCracken K.G., and Steinhilber F., (2012), Is there a planetary influence on solar activity?, A&A 548, A88. 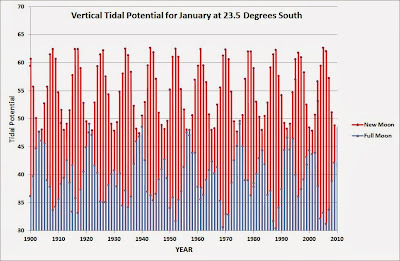 The VEJ Tidal Torquing Model can explain many of the long-term changes in the level of solar activity. It has long been recognized that there is a prominent 208 year de Vries (or Suess) cycle in the level of solar activity. Its appearance, however, is intermittent. Careful analysis of the Be10 and C14 ice-core records show that the de Vries cycle is most prominent during epochs that are separated by about 2300 years (Vasiliev and Dergachev, 2002). This longer modulation period in the level of solar activity is known as the Hallstatt cycle ( Vitinsky et al., 1986; Damon and Sonett, 1991; Vasiliev and Dergachev, 2002). 1. The VEJ tidal-Torquing model proposes that tidal bulges are formed in the base of the convective layers of the Sun by the periodically alignments of Venus and the Earth, and that it is the gravitational torque that are applied to these bulges by Jupiter that are responsible for the long-term modulation of the Solar activity cycle. Hence, it needs to be shown that the torques that are applied by Jupiter to these tidally induced bulges, naturally exhibit a 2300 year Hallstatt-like cycle. 2. The length of the 243 year Venus transit cycle is set by the time it takes for the Earth-Venus-Sun line to re-align itself with one of the "fixed" nodes of Venus' orbit. Hence, the length of the transit cycle is determined by time it takes for the five-pointed star Venus-Earth alignment pattern to re-establish rotational symmetry plus the time it then takes for the Venus-Earth alignments to return to the "fixed" node [Note: "fixed" in this case means, roughly the same position with respect to the fixed stars]. 3. A similar strategy to that used to determine the length of the Venus transit cycle is then applied to determine the time required to precisely re-align the Jupiter torque cycle. The full length of this torque cycle includes both the time required for the realignment of the orbital position of Jupiter with respect to the Venus-Earth alignment pattern and the time required for Jupiter to re-establish its rotational symmetry pattern with respect to the fixed stars. 4. It is shown that the Jupiter torque cycle naturally exhibits a 2302 year Hallstatt-like cycle. (*) Note that most of the values used in this blog post are stated to four decimal places. This is not being done to claim that the values have a precision to this level of accuracy but solely for the purposes of delaying the curtailment of the number of decimal places until the end of the calculations. In addition, it is important to note that the calculation done here are just a preliminary attempt to explain why the VEJ Tidal-Torquing model produces changes in planetary torque acting upon the Sun that exhibit a Hallstatt-like cycle. A detailed analysis of ephemeris data will have to be done before these preliminary results can be confirmed. Venus-Earth Alignments in a Reference Frame That is Fixed with Respect to the Stars. The following diagram shows five consecutive alignments of Venus and the Earth following the alignment of 2004. Each inferior conjunction of the Earth and Venus (i.e. VE alignment) is separated from the previous one by the Venus-Earth synodic cycle i.e. 1.59866 years. This means that, on average, the Earth-Venus-Sun line moves by 144.4824 degrees in retrograde direction, once every VE alignment. Hence, E-V-S line returns to almost the same orientation with respect the stars after five VE alignments or eight Earth (sidereal) years [actually 7.9933 years]. The above figure shows that after five VE alignments (i.e 7.9933 years), the E-V-S line falls short from completing one full orbit of the Sun with respect to the stars by [(360-(360*(7.9933 - 7.0000))) =] 2.412 degrees. Hence, the E-V-S line slowly revolves about the Sun, taking 150 EV alignments (= 239.7990 years) to move backwards [clockwise in the above diagram] by one point in the five pointed star or pentagram pattern. [Note: the actual movement is 72.36 degrees over the 239.7990 years while the mean spacing between each point on the five pointed star is 72.2412 degrees]. Hence, the 239.7990 year realignment symmetry for the VE alignments naturally produces a 243 year repetition time between the transits of Venus in front of the Sun. The reason for this is that the star point that is aligned with the South Node of Venus' orbit (i.e. the one pointing out of the figure above) moves one to the left after 239.7990 years, and so two extra VE alignments are required (along lines 4 and 5 in the above diagram) on top of the 150 VE aligns in 239.7990 years. This means that it takes 152 VE alignments = 242.9963 ~ 243 years before the Earth and Venus re-align near the South Node of Venus' orbit, again. The precise re-alignment period for the VE Pentagram is actually 149.5 VE alignments of 1.59866 sidereal years = 238.9996251 sidereal years. However, since, a half VE alignment cannot give a transit of Venus across the Sun - the precise alignment occurs with Venus on the far side of the Sun. This means that transits of Venus in front of the Sun repeat at either 147 VE alignments = 235.0029759 sidereal years or 152 VE alignments = 242.9962744 sidereal years, with the latter being favored in recent times. Technically, a complete repetition cycle of the pentagram pattern in VE alignments requires that E-V-S line revolves backwards by two star points (i.e. 144.4824 degrees) on five separate occasions. Hence, it takes 299 EV alignments (= 477.99934 years) to rotate backwards by two pentagonal star points and 1495 VE alignments (= 2389.9967 ~ 2390 years) to move backwards through the full Venus-Earth alignment pentagram pattern. Hence, the VE alignment pentagram has a 2390 year Hallstatt-like symmetry re-alignment cycle with respect to the fixed stars. There raises the possibility that this 2390 year cycle could play a role in modulating any long term cycles that exist in the torque being applied by Jupiter to the VE tidal bulge. However, to look for these long-term periodicities in Jupiter's torque, we need to investigate how Jupiter moves, with respect to the periodic VE tidal bulge in the convective layers of the Sun. This requires us to look at the motion of Jupiter in both a fixed frame with respect to the stars and a frame that is revolving about the Sun at the same rate as the periodic VE alignments. 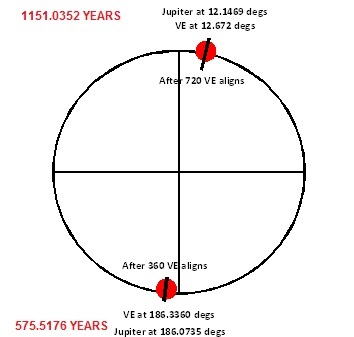 The diagram immediately below shows the orbital position of Jupiter, starting at (0,1), every 0.79933 years, over a period of 35.9699 years [i.e. just over three orbits of the Sun]. It is clear from this diagram that, in a reference frame that is fixed with respect to the stars, the symmetry pattern perfectly re-aligns after moves roughly 24.26 degrees in a clockwise (pro-grade) direction. It takes Jupiter 71.9397 years (i.e. just over six orbits of the Sun or 45 VE aligns) to move 23.30 degrees in a clockwise (pro-grade) direction, to approach with one degree of producing a re-alignment of rotational symmetry. The Movement of Jupiter with Respect to the Tidal-Bulge that is Induced in the Convective Layers of the Sun by Periodic Alignments of Venus and the Earth. The slow revolution of the Earth-Venus-Sun alignment axis can be removed provided you place yourself in a framework that rotates by 215.5176 degrees in a pro-grade direction [with respect to the fixed stars] once every 1.59866 years. In this rotating framework, Jupiter moves in a pro-grade direction (with respect to the Earth-Venus-Sun line) by 12.9993 degrees per [inferior conjunction] VE alignment. The following diagram shows the position of Jupiter every VE alignment (i.e. 1.59866 years) in reference frame that is rotating with the Earth-Venus-Sun alignment line. This keeps the Earth and Venus at the 12:00 o'clock position in this diagram whenever the number of VE aligns is even and at the 6:00 o'clock position whenever the number of VE aligns is odd. 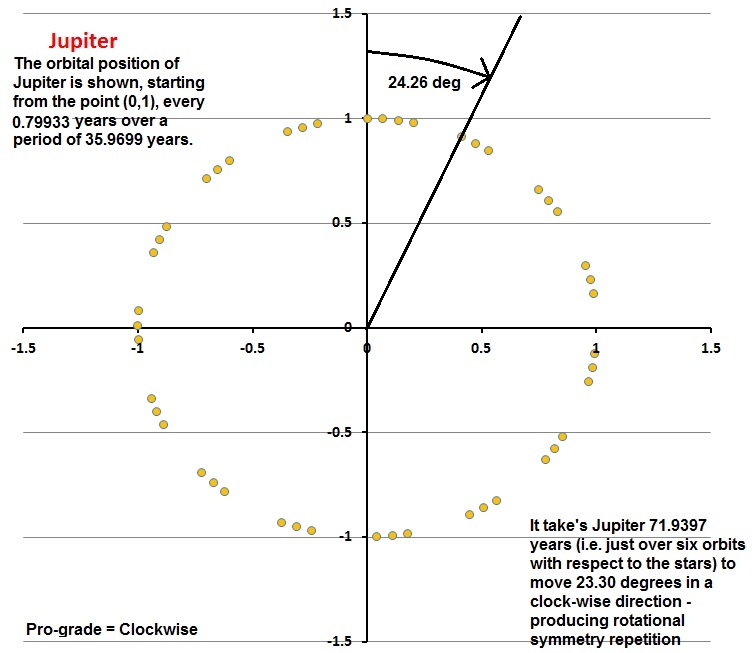 In contrast, Jupiter starts out at JO and moves 12.9993 degrees every 1.59866 years, taking 11.07 years to move exactly 90 degrees in the clockwise (pro-grade) direction and 11.19 years to the position marked J7. Also shown on this diagram is the position of Jupiter after 27, 28 and 29 VE alignments. 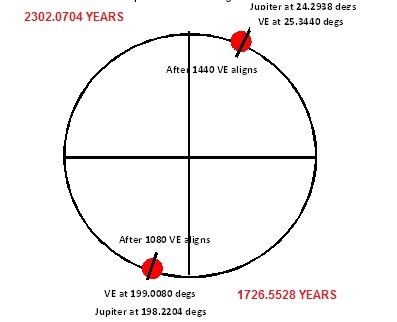 This tells us that Jupiter completes exactly one orbit in the VE reference frame once every 44.28 years (= 11.07 years x 4), with the nearest VE alignment taking place at 28 VE alignments (= 44.7625 years) when Jupiter has moved 3.9796 degrees past realignment with its original position at JO. 13 orbits in the VE reference frame plus 51.7345 degrees. This angle (see * in table) is almost exactly equal to the angle moved by Jupiter in 4 VE aligns (i.e. 4 x 12.99927 degrees = 51.9971 degrees). 575.5176 years (360 VE aligns) and 1151.0352 years (720 VE aligns) in a frame of reference that is fixed with respect to the stars. Jupiter lags behind the VE alignments by 0.2654 degrees and 0.5251 degrees, respectively. The next diagram (directly below) shows the precise alignments of Jupiter with the Earth-Venus-Sun line at 1726.5528 years (1080 VE aligns) and 2302.0704 years (1440 VE aligns) in a frame of reference that is fixed with respect to the stars. Jupiter lags behind the VE alignments by 0.7876 degrees and 1.0502 degrees, respectively. 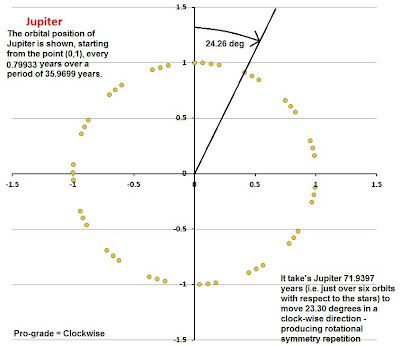 The important point to note is that after four precise Jupiter alignments of 575.5176 years (= 2302.0704 years), the position of Jupiter advances from its initial position at JO (see the third diagram in this blog post) by 24.2983 degrees. This angle is almost exactly the same as 24.26 degrees of rotation that is required to produce a re-alignment of the rotational symmetry of Jupiter, in the reference frame that is fixed with respect to the stars. Hence, the period of time required for Jupiter to precisely re-align with the Earth-Venus-Sun line in a reference frame that is fixed with respect to the stars is 2302 years. This is the Hallstatt-like cycle that is naturally found in the planetary configurations that are driving the VEJ Tidal-Torquing model for solar activity. Damon, P.E. and Sonett, C.P., 1991, “Solar and terrestrial components of the atmospheric 14C variation spectrum”, in The Sun in Time, (Eds.) Sonett, C.P., Giampapa, M.S., Matthews, M.S., pp. 360–388, University of Arizona Press, Tucson. Vasiliev, S.S. and Dergachev, V.A., 2002, “The ∼2400-year cycle in atmospheric radiocarbon concentration: bispectrum of 14C data over the last 8000 years”, Ann. Geophys., 20, 115–120.